Our pumps are designed to handle many transfer and manufacturing applications. We sell to the adhesives market (plywood, glue manufacturing, laminates), petroleum market (transfer, sludges, production), chemicals, and explosive slurries markets. Whether your application involves abrasive, viscous or corrosive applications NAPCO can assist you with your pumping needs. NAPCO rotary gear pumps are available in 2″ and 3″ outlet port sizes and in 316 stainless steel or ductile iron construction. We currently produce gears in both nitrile rubber or viton. Offering 65 to 350 GPM capacities, self priming, clockwise or counter-clockwise operation, top or bottom impeller driven, the NAPCO Rotary Gear Pump handles a broad range of pumping applications. The NAPCO rotary gear pump is available in 316 stainless steel and ductile iron, and can handle a broad range of pumping applications from water to highly viscous or abrasive fluids. It can also handle some corrosive fluids. It comes fully lubricated and ready for use. It operates clockwise or counter-clockwise with equal efficiency. The rotary gears come standard in high temperature nitrile rubber, but neoprene, viton and other gear material can be ordered to handle special higher temperature or corrosive fluid applications. 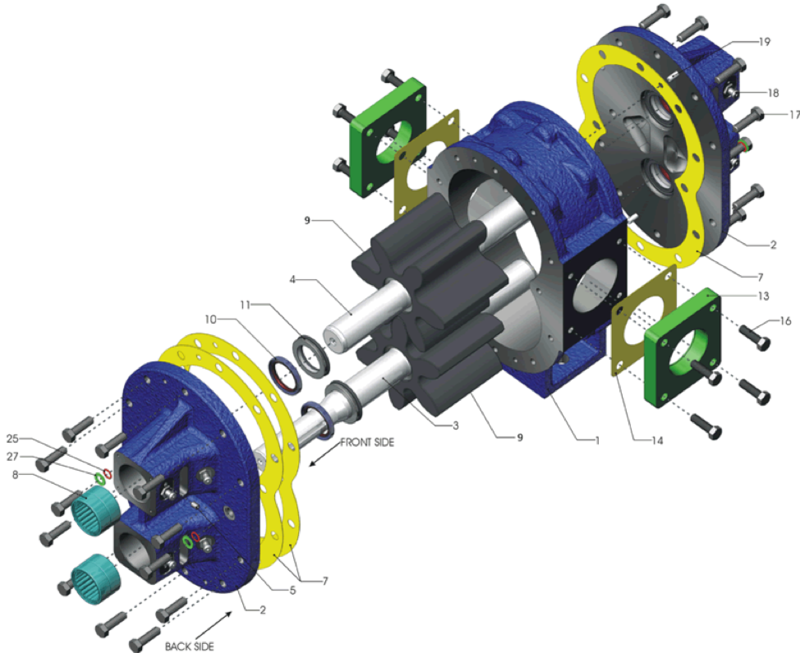 NAPCO rotary gear pumps are positive displacement pumps. As the rotary impeller turns, the gear teeth open, creating an expanding cavity on the inlet side to vacuum fluid into the pump chamber. The impellers carry the product around the pump cavity to the outlet side and, upon meshing on the outlet side, force the fluid out of the pump. The drive gear and idler gear are the only moving parts in the pump. The outer lip seals (low pressure) and inner seals (high pressure) ride on especially hardened shaft surfaces. The four inner high pressure seals seal the pump chamber and the four outer lip seals create lubrication chambers. The two shafts ride on four outboard roller bearings –one on each shaft end– that are spatially separated from the seals and pump chamber by weep holes in the bearing housings/side covers. 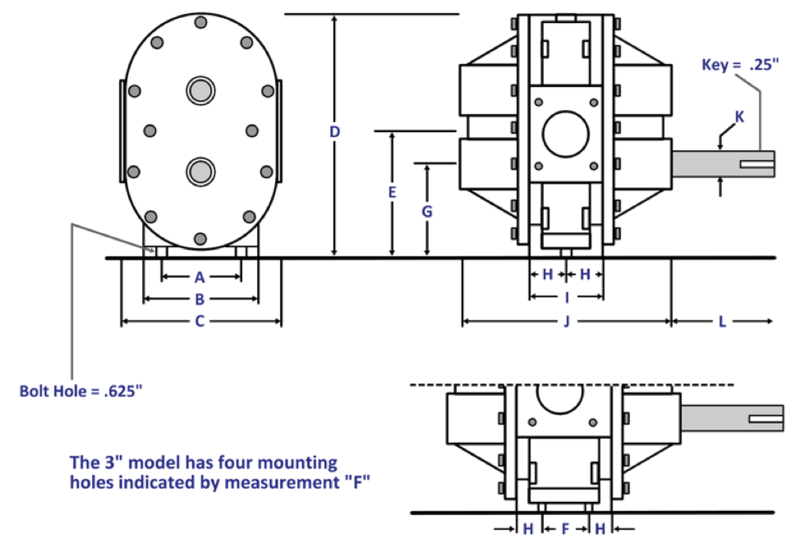 Anti-cavitation traps on the inside walls of the bearing housings/side covers minimize shaft flex that would otherwise result from product being trapped between the meshing gears. The discharge ports are designed to allow the gears to rotate and move product in either direction through the pump chamber. NAPCO rotary gear pumps come in 2” and 3” discharge port sizes and handle volume capacities ranging from approximately 60 to 350 GPM. They are designed to generally operate up to 300 RPM yielding pressures up to 100 psi. Running at speeds higher than 300 RPM will accelerate wear. Consult with NAPCO if operating pressures in excess of 150 psi are expected. Where the design application calls for pumping an abrasive product, increasing the NAPCO pump size and decreasing the pump speed is the most likely way to increase pump performance. NAPCO rotary gear pumps are designed to pump viscous and abrasive fluids and some corrosive fluids. The closely machined tolerances between the operating surfaces allow them to efficiently pump non-viscous fluids as well. The pumps can operate equally well in a clockwise or counter-clockwise rotation of the gears, and with the drive gear in the upper or lower chamber position. The following pump data was tested with water (specific gravity 1.0). Consult NAPCO for specific pump size and speed recommendations for your application. Higher viscosity liquid products may require a lower pump RPM to achieve the desired GPM and discharge pressures. NAPCO rotary gear pumps are available in ductile iron and 316 stainless steel and come standard with high temperature nitrile rubber gears good for operating temperatures up to 240 degrees Fahrenheit. Where higher temperatures or corrosive fluid conditions are to be encountered, NAPCO can work with its customers to provide gear material out of various metals and elastomers, such as neoprene, EPDM, urethane and viton. Please check with NAPCO or your local distributor as to the suitable gear and pump case for your particular product application. For further information on the material composition of NAPCO pump parts, see Section “Pump Materials and Composition” below. In addition to the NAPCO Spare Part Repair Kits and Gear Assemblies discussed above, a customer may also order specific spare parts from NAPCO. Please consult the blow-out diagram below to identify the specific part needed, including name and identification number. Many parts are available in ductile iron or stainless steel material. Ductile iron parts have a “C” letter in their part number. Stainless steel parts have an “S” letter in their part number. To get in touch with us please fill out the form. Please provide as much information as you can, we will be in touch with you soon!